Carman & Clemens (ed. ): "The Maryland Campaign of September 1862, Volume 1: South Mountain"
Although he fought in numerous battles east and west, Bvt. Brigadier General Ezra A. Carman will be forever associated with the battlefield at Antietam, where he led the 13th New Jersey infantry regiment. After the war, and with no prior historical training, he was appointed to the position of historical expert for the board overseeing the Antietam National Battlefield. Sifting through official documents and voluminous correspondence from participants, Carman created a campaign and battle history (as well as a map set) of unusual depth and accuracy. 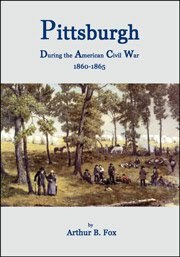 While the manuscript has always been at the center of serious Antietam scholarship, it remained unpublished until 2008, when an edited edition prepared by Joseph Pierro was released by Routledge Press. A concurrent project, this time divided into two volumes and undertaken by noted subject expert Thomas G. Clemens, came to fruition earlier this year with the spring publication of The Maryland Campaign of September 1862, Volume 1: South Mountain. With the earlier publication concerning itself mostly with general editing and source verification duties, it remained for someone else to fully police Carman the historian, evaluating his sources at length and reviewing his interpretations. However, in order to properly handle such a monumental task, the evaluator himself needs to have a mastery of the sources that Carman had access to as well as the body of material that emerged during the century following Carman's latest revisions. Clemens is certainly among the handful of individuals that fit the bill. Errors and conflicts on Carman's part, duly noted, are inevitable, but what is extraordinary is how well Clemens found the manuscript to hold up factually. The notes, placed at the bottom of each page for easy reference, provide source references, scholarly disputation, background, and explanatory material. When using modern sources to evaluate Carman, Clemens relies heavily on the interpretations of his mentor, Joseph Harsh, whose three volumes are considered by many today to be the preeminent commentaries on the military conduct of the Antietam campaign. In researching and compiling his material, Carman developed good relationships with ex-Confederates and the content and tone of his writing as pertaining to his former enemies is evenhanded, and in many cases quite positive. Alternating defense and criticism (sometimes contradicting earlier statements), Carman's writing seems a bit conflicted about McClellan and the planning and conduct of the Army of the Potomac's march to Antietam, but he is not the relentlessly dedicated critic that so many modern historians continue to be. Instead, Carman reserved his greatest disdain for Henry Halleck. As stated before, Clemens's work will fill two volumes. Volume I takes the reader through the investment of Harper's Ferry and the fighting at the South Mountain gaps (Crampton's, Turner, and Fox), before concluding with the Confederate move behind the Antietam. A pair of appendices (orders of battle and an author interview), a bibliography, and an index round out the volume. 22 original maps augment the text. With them, terrain rendering is detailed and attractive; however, in my opinion, traditional NATO icons better convey information and instant recognition of org levels (e.g. regiment, brigade, division) than the book's chosen infantry and cavalry unit symbology. In the overall picture, the maps are only a minor complaint. From reading the manuscript and Clemens's expert editing, one easily sees why modern Antietam scholars lean heavily upon Carman's pioneering work. One wishes all Civil War battlefields had been likewise gifted with such a worthy and dedicated veteran sponsor. Soon, with the completion of the pair of volumes comprising The Maryland Campaign of 1862, all readers will have easy and affordable access to a classic of Civil War historiography, as well as a mammoth editorial project of significant scholarship in its own right. The Spruills certainly belong to the thunder and lightning school of thought when it comes to their guidebook titles. David Woodbury will be disappointed to discover that his hope for a moratorium has been rudely dashed with the upcoming Summer Thunder: A Battlefield Guide to the Artillery at Gettysburg by Matt Spruill (U. of Tennessee Press, Sept. 2010). Following a support arm around the battlefield is certainly a new take on the traditional battlefield tour guide/staff ride format. Fox: "PITTSBURGH DURING THE AMERICAN CIVIL WAR 1860-1865"
When it comes to Pennsylvania cities and towns, Gettysburg and Philadelphia (as one might expect) get most consideration from the publishing world, but author Arthur B. Fox has done much to bring attention to the western part of the state, specifically Allegheny County and the emerging industrial city of Pittsburgh. His book Pittsburgh During the American Civil War 1860-1865 (Mechling Bookbindery, 2002) was reissued in paperback last year. An excellent all around survey of the city's participation in the war, it is well worthy of the privilege. Fox's book is not presented as a cohesive narrative history, but rather an informative and winding series of explanatory sections, replete with directions, maps, drawings, lists, and tables, more akin to a reference work. In line with the city's importance to war industries, several chapters are devoted to civilian businesses, war contractors, and military arms and ammunition production, most famously the Allegheny Arsenal and Fort Pitt Foundry. Local firms of all types are summarized and located for the reader. Events and circumstances surrounding the tragic series of explosions at occurred at the arsenal on September 17, 1862, killing close to 80 workers (mostly young women), are discussed. The foundry produced large numbers of heavy cannon for the war effort, and Fox goes into some depth describing the Rodman method of casting increasingly massive guns, the culmination of which was a colossal 20-inch smoothbore firing a projectile weighing over 1,000 lbs. Another interesting tidbit was the author's discovery, through local newspapers, of managers at the arsenal openly threatening workers with termination if they did not vote for Lincoln in the 1864 election, and following through with their threat. If true, one wonders how widespread was the practice. Companies raised in Pittsburgh and the surrounding county are listed, and much information about the nine military camps that dotted the landscape 1861-1863 is provided. Pittsburgh hospitals are also discussed, as well as Confederate POWs. A pair of appendices additionally deal with city and county GAR posts and orphanages. As one can readily see, Fox's coverage of local institutions is quite comprehensive. With the threat of Confederate raids into the state in 1863, a series of earthwork forts were constructed around Pittsburgh, ringing the city by the time of the Gettysburg Campaign. Period photographs do not exist, but a series of post-war images (several are reproduced in the book) documented the sites before they were destroyed by urban expansion. Aided by William McCarthy's 1992 history and archaeological survey of the dozens of forts, redoubts, and batteries, Fox provides a complete summary of these sites and their original location. A pair of period maps, including a large pullout, also reference these sites, as well as the arsenal and camps. Well researched, and generously filled with images, maps, and data tables, Pittsburgh During the American Civil War 1860-1865 is a wonderful example of local history done right, as well as an invaluable guide for outside readers and historians seeking to learn more about the city's manpower and industrial contributions to the Union war machine. Highly recommended. Author Scott Patchan mentioned on his blog that Potomac Books will be publishing his Second Manassas: Longstreet's Attack and the Struggle for Chinn Ridge (April 2011). Additionally, The History Press will put out an updated and expanded edition of one of my favorite books, Patchan's The Forgotten Fury: The Battle of Piedmont. For details, go here. Forsyth: "THE RED RIVER CAMPAIGN OF 1864 AND THE LOSS BY THE CONFEDERACY OF THE CIVIL WAR"
In the decades passed since the publication of Ludwell Johnson's classic Red River Campaign: Politics & Cotton in the Civil War, the disastrous 1864 Union sojourn in Louisiana has been treated to a number of brief survey histories. While none of these have truly surpassed Johnson overall, and full length battle studies remain nonexistent, recent works, especially those of Gary Joiner, have further illuminated certain aspects of the campaign. 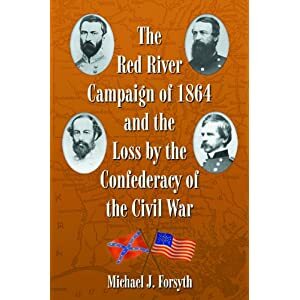 Reissued in paperback this year, Michael J. Forsyth's slim book The Red River Campaign of 1864 and the Loss by the Confederacy of the Civil War is less of a broad summary (although it does provide a suitable one) and more of an analytical treatise that focuses on the question of whether the Confederates could have achieved a victory decisive enough to alter the course of the war had different command decisions been made in the aftermath of the April 9, 1864 Battle of Pleasant Hill. Forsyth agrees with previous writers that the entire campaign was a serious strategic mistake on the part of the Union high command, and he fervently believes that it was the Confederates that were in much the better position to exploit a major victory in the wilds of central Louisiana. Historically, even though victorious at Pleasant Hill, Union army commander Nathaniel Banks elected to retreat down the valley of the rapidly falling Red River, seriously harassed all along his route by Richard Taylor's greatly diminished army, then composed mostly of cavalry. Central to the author's thesis is his assertion that the Confederacy fumbled this golden opportunity to destroy an entire enemy army and fleet. Forsyth asserts that had Confederate commander Edmund Kirby Smith not stripped Richard Taylor of his three infantry divisions and diverted them to Arkansas, one of the Confederacy's best chances to force a surrender of an entire Union army, and destruction of a large gunboat fleet, was lost. While the author discounts the notion, self-interestedly promoted by Richard Taylor himself in his memoir Destruction and Reconstruction, that such a result would have been a foregone conclusion, he believes the possibility very much existed. That said, Forsyth goes further than most in maintaining that such a decisive strategic victory could have been a war winning gambit for the Confederates. His thought process is that, by denying use of essentially two corps of veteran troops that would historically prove to be critical components of important Union victories, those events would be overturned or at least rendered less decisive. The lengthening of the war absent those morale boosts would then have caused Lincoln to lose the November election. So, what of these possibilities outlined by the author. Specifically, Forsyth offers three points where he believes a strong chance of actually trapping and destroying Banks in Louisiana existed -- at Grand Ecore early on in the retreat, between the Cane and Red rivers at Monett's Ferry, and finally at Alexandria. Even against Taylor's tiny, mostly mounted, force, all of these points proved historically problematic for Banks as he tried to extricate his army and cover the navy, and it is not unreasonable to contend that the retention of three entire infantry divisions with the aggressive Taylor in command might have produced decisive results. While he rightly acknowledges the fact that these ideas are not entirely original ones, Forsyth's point that previous writers have proven less willing to imagine greater results attached to a more complete Confederate victory beyond prolonging the war by a few months is well taken. What Forsyth is promoting here is not outlandish, but his line of thinking does require acceptance of a chain of what-ifs (usually the death of big idea hypotheticals). Furthermore, he, like many authors and historians, equates Lincoln's loss of the 1864 election with Confederate victory, a debatable supposition. Finally, whatever the circumstances, and however erratic Banks's decision making might prove, the Confederate army as a whole did not exactly have a track record of being able to force the surrender of large veteran Union armies, let alone those also backed by a powerful naval contingent. However persuasive one ultimately finds his exercise in counterfactual history to be, Michael Forsyth has nevertheless crafted one of the best short works on the subject of the Red River Campaign. There is certainly enough of an all around history of the campaign (based on a judicious synthesis of the available literature) present to recommend the book to new readers seeking an introductory work. Meanwhile, serious students of the campaign can appreciate its thoughtful arguments and analysis. 1 - The 2010 ed. is a paperback reissue. The first ed. hardcover was released back in 2001 from the same publisher. 2 - A campaign timeline, orders of battle, and maps. The latter are a combination of O.R. atlas and Battles & Leaders reproductions, as well as original schematic drawings created by the author. "The History of Rome Hanks and Kindred Matters"
The Weider Group newsletter linked to one of their videocasts, which asked author Peter Cozzens to name his favorite Civil War book. His surprising answer was The History of Rome Hanks and Kindred Matters (Scribner, 1944) by Joseph Stanley Pennell. I have never heard of novel or author. You can find copies cheaply, even apparently the first edition, online. Has anyone read it? The Stone’s River Campaign - 26 December 1862 - 5 January 1863: Volume II The Army of Tennessee by Lanny Kelton Smith (Author, 2010). Volume I was stocked in the Stones River National Battlefield bookstore and it is expected, but not confirmed at this time, that Volume II will also be made available there. These books are a must have for serious students of the battle. Secrist: "THE BATTLE OF RESACA: Atlanta Campaign, 1864"
Historian and dedicated student of the Atlanta Campaign Philip Secrist, who passed away in 2008, first published his brief history of the May 1864 Battle of Resaca back in 1998. In spring 2010, it was reissued by Mercer University Press in a very reasonably priced paperback format. It appears to be a straight reprint, with the qualification that the four color maps that appeared in the hardcover first edition are reproduced in black and white. Secrist's account of the battle itself (Part I of his book) was originally published in article form for the Atlanta Historical Society Journal (Spring 1978 issue). At 60 pages, interspersed with full page illustrations, it is a concise overview of the fighting on May 14 and 15, but it is well written and informative. The action is recounted at mostly division scale with more detailed discussions presented on occasion, such as that of the attack against the exposed salient occupied by the Cherokee Artillery battery on the 15th. The writing is justifiably critical of William T. Sherman's cautious handling of the battle, but perhaps a bit too certain that an all out frontal assault on the 15th would have completely overthrown the Confederate defenses. The book's thirteen maps, ranging from original author line drawings over modern topographical maps to historical reproductions, are especially helpful in visualizing the terrain, but they also trace the opposing lines as a whole and mark the location of the ground over which divisional assaults occurred. Also integrated into the text is a series of photographs from the famous set of battlefield images of the Atlanta Campaign shot by George Barnard. They greatly enhance our knowledge of the historical lay of the land, and remind us of the value of systematic photographic studies of Civil War battlefields in the immediate aftermath of the fighting. Part II is a discussion of discoveries on the battlefield by modern relic hunters. It also summarizes the results of the 1960 archaeological study that preceded the construction of I-75. The author, a relic hunter himself, was of the opinion that the field work did not measurably enhance the findings of previous efforts, and called for the pairing of professionals with knowledgeable avocational relic hunters armed with metal detectors, a collaboration that has proven useful in modern battlefield archaeology*. With the literature's continued rather baffling absence of book length studies of the battles of the Atlanta Campaign, Philip Secrist's The Battle of Resaca remains a useful summary as well as a unique look at the battlefield itself. It is a welcome reissue, well worth owning. 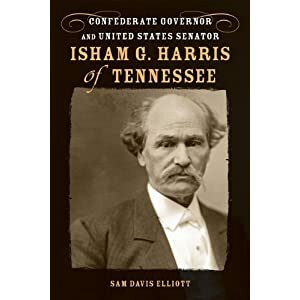 Elliott: "ISHAM G. HARRIS OF TENNESSEE: Confederate Governor and United States Senator"
Compared to the legions of minor Civil War military figures that have been accorded full biographical treatments, governors have been surprisingly neglected in the literature. Thus, when one does emerge, it serves notice. Deserving of attention is Sam Davis Elliott's new book Isham G. Harris of Tennessee, a scholarly work that provides readers with a meticulous political biography of the man as well as an account of the governor's wartime role as military aide and advocate for his state's Confederate soldiers. According to the author, no great body of Harris papers exists. In spite of his obvious handicap, Elliott has dutifully attempted to outflank the roadblock by poring through an impressive array of other primary and secondary sources. While the reader thus gains few insights into Harris's personality and relationships with intimates and family, the Tennessean's political career as governor and senator is painstakingly recreated. Isham Harris appears to have been one of those rare powerful Confederates who was able to get along well (or at least never badly) with essentially everyone he needed to get along with, from President Davis on down through all the prickly commanders of the Army of Tennessee. The evidence uncovered by Elliott shows that Bragg, Beauregard, and the Johnstons all held Harris in high personal esteem and seem to have truly valued his services and presence on the field. Most Civil War readers will recognize Harris as the man who held the dying Albert Sidney Johnston in his arms at Shiloh. Also, at at least two points during the war, the governor was also seriously considered for appointment as a general officer. With the fall of the state capital in early 1862, Harris attached himself as a volunteer aide to the headquarters of the Army of Tennessee, and he spent the rest of the war on the move in support of the army, always advocating for Volunteer State officers and men. Elliot does a very good job of comprehensively tracing these movements and interactions. A military aspect that one wishes the author had devoted more attention to was the governor's role in the funding, organization, and staffing of the Provisional Army of Tennessee, the state precursor of the Confederate Army of Tennessee. On the other hand, perhaps it was felt by Elliott that the subject was covered well enough in the first volume of Thomas L. Connelly's standard history of the army. Also, while the author does mention such criticism in passing, a more detailed discussion of whether Harris's direct attachment to the army and tireless attention paid to it led him to neglect his other duties might have been in order. While many biographies of important Civil War figures tend to peter out in the postwar period, Elliott devotes over a third of his study to Harris's life after the war, one that included a period in exile, a renewed law practice, and a lengthy second career in the United States Senate. Indeed, from reading Isham G. Harris of Tennessee, one gets as much a history of 19th Century Democratic politics, state and federal, as a biographical treatment of the man. Author Sam Davis Elliott has succeeded in making the best of a difficult situation, and his impressively researched biography will likely be regarded as the standard work on Governor Harris's political career. 1. The Two Civil War Battles of Newtonia by Larry Wood (The History Press, 2010). The book concentrates much more on the first battle (Sept. 30, 1862) than the second (Oct. 28, 1864), which is too bad given the even greater lack of coverage for the latter. Although notes are absent, there's a bibliography and 20 maps covering the battles at short intervals, detailing both terrain features and troop positions (at regimental scale). Even undocumented, it looks to be a must have for Civil War Missouri readers. 2. Receding Tide: Vicksburg and Gettysburg - The Campaigns That Changed the Civil War by Edwin C. Bearss and J. Parker Hills (National Geographic, 2010). Here, Parker Hills constructs a narrative out of Bearss's tour transcripts, which I gather is a similar format to the earlier Fields of Honor, also published by NG. It's more Vicksburg than Gettysburg, which is proper and unsurprising. With less than a dozen books devoted to Florida units and their military exploits, that particular category remains underexplored in the modern historiography. Instead, much of the literature is devoted to the state's role as the breadbasket of the Confederacy. 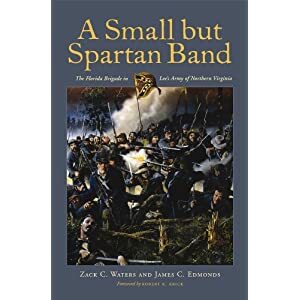 Fortunately, Zack Waters and James Edmonds have rescued the officers and men of the eastern theater's Florida Brigade from obscurity with their book A Small But Spartan Band. As Robert K. Krick mentions in the Foreword (and he would know), primary source material written by members of Confederate units with isolated homelands is scarce, and Florida particularly so. Nevertheless, he praises the authors for discovering as much manuscript material as they did, scattered far and wide. Florida had a pre-war population composed of only 15,000 men of military age so paucity of units is one reason for their relative obscurity, but another is that Florida regiments lacked a widely recognized and defining moment in an important battle. Worse, they often had a reputation, deserved or not, for unsteadiness. However, as Waters and Edmonds demonstrate, the units of the Florida Brigade (at its core, the 2nd, 5th, and 8th Florida regiments) performed much like any other, with good days and bad. The brigade history begins with an organizational summary of the 2nd Florida, which participated in the battles of Williamsburg, Seven Pines, and the Seven Days, suffering very heavy casualties along the way. It was joined by the 5th and 8th regiments in August of 1862. These men joined their fellow "Flowers" only to suffer terrible casualties at Antietam. The brigade's leadership was decimated as well, a situation that seemed to plague the Floridian units throughout the war [to what degree the scale of their command losses is unusually high is difficult to tell]. The authors go on to describe the movements and battles of the Florida Brigade from Fredericksburg to the end of their war at Appomattox. Although a group surrender that occurred on the streets of the town was comparatively small, Fredericksburg was a bit of a blow to the men's prestige, but the already skeleton-sized brigade performed well at Gettysburg, especially in the attack on the Union center on Day 2. Waters and Edmonds devote three full chapters to the Gettysburg campaign, followed by an additional one discussing the newspaper war that erupted in the aftermath of the defeat, in which the Floridians were unfairly maligned. This brings to mind another handicap that had to be borne by Florida troops, the lack of prominent newspaper support and coverage in comparison to other states like Virginia and South Carolina. During the latter stages of the Petersburg Campaign, a high desertion rate also led critics to mock their loyalty. The leadership of the brigade is also fully examined, especially regimental and brigade commanders Edward Perry, David Lang, and Joseph Finegan. While Perry and Lang are the officers most identified with the brigade, Finegan brought up from Florida in May 1864 much needed reinforcements in the form of several battalions, veterans of Olustee (Ocean Pond). A final chapter looks at the post-war careers of many of the men mentioned in the text, with an interesting profile of Lincoln conspirator and attempted assassin Lewis Powell, a onetime member of Company I, 2nd Florida. The text is supported by eight maps, depicting the position(s) of the brigade and its regiments during important battles. Another traces the county of origin of each company. Combining unimpeachable research with a thoughtful and well constructed narrative, A Small But Spartan Band is a highly recommended brigade history of a much understudied group of men. Now someone needs to tackle the Floridians that served in the Army of Tennessee. 1. My Old Confederate Home: A Respectable Place for Civil War Veterans by Rusty Williams (Univ. Press of Kentucky, 2010). I don't know how many of these places operated throughout the southern and border states, but I remember a pleasant visit to the Confederate Soldiers Home of Missouri in Higginsville back in the mid-1990s. Here, Rusty Williams tells the story of the Kentucky Confederate Home (1902-1934) for poor and disabled vets. From the photos, it looked like a nice place to spend one's final years. 2. Faith, Valor, and Devotion: The Civil War Letters of William Porcher DuBose edited by W. Eric Emerson and Karen Stokes (Univ. of S. Carolina Press, 2010). DuBose was a seminary student at the outset of the war, and became an oft wounded officer in the Holcolme Legion before being appointed chaplain to Kershaw's brigade. His 150 letters cover service in Virginia and the Carolinas, as well as more personal correspondence with his wife to be. Hollis & Stokes (eds. ): "TWILIGHT ON THE SOUTH CAROLINA RICE FIELDS: Letters of the Heyward Family, 1862-1871"
The degree of economic devastation and social dislocation in many areas of the South during the Civil War years and Reconstruction was certainly unprecedented in America and remains unmatched. From the earliest point of the war, wealthy rice planters, whose plantations were situated along the coastline of South Carolina and its even more vulnerable sea islands, experienced the brunt of these shocking changes. 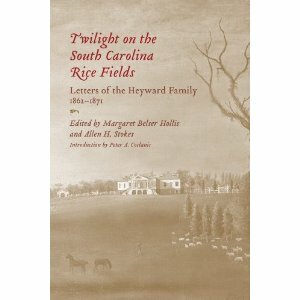 The Heywards, with holdings inland near Columbia and at the coast's Beaufort District, were just such a family, and their wartime and Reconstruction letters are transcribed, compiled, and edited by Margaret Belser Hollis, Allen H. Stokes and others in Twilight on the South Carolina Rice Fields. The letters contained in this thick volume reveal much about Edward Barnwell "Barney" Heyward (1826–1871), his relationship with his family, and his struggle to maintain his land, slaves, and wealth in the midst of war. During the war, Heyward's name was submitted to Secretary of War Seddon by Robert W. Barnwell for an officer commission in the Confederate Engineering Department, so his writings also provide some insight into military events in the area. A large number of the letters included in the book are to and from Barney's wife Catherine "Tat/Tattie" Maria Clinch Heyward, so domestic matters receive a great deal of attention, too. Though the book is a hefty tome at almost 500 pages in length, supplemental scholarship is at a minimum, at least compared to the typical modern edited letter collection published by a university press. However, a series of brief biographical sketches of Heyward and Clinch family members is provided, as well as a fine introduction by Peter A. Coclanis that properly contextualizes the place of the Heywards within the rice economy and rice economy as an important dimension in international trade. The correspondence is not formally annotated, with the editors's occasional and unsourced (but useful) comments located at the end of each letter. As explained in the brief Editorial Method section at the book's front, this largely non-interventional methodology is similar to that employed by Cook for the Papers of John C. Calhoun project. The material is transcribed verbatim with changes set apart by brackets and new headings provided. While a good index is present, there is no bibliography. 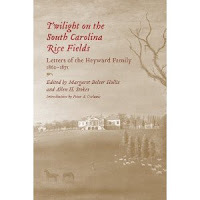 Tracing a remarkable period of societal upheaval at a personal level, the Heyward family letters collected in Twilight comprise a valuable resource for readers and researchers interested in South Carolina's rice culture and economy. It also sheds light on a family less well known today [I had never heard of them until this volume] but highly influential in antebellum American politics and history. Recommended. A list of additional 2010 Civil War-related books forthcoming from The History Press has been provided me. The titles are coming fast and furious and several of the following look quite interesting. Fellow Missouri enthusiasts will, in addition to the current Newtonia book mentioned earlier (here), undoubtedly appreciate the Pilot Knob and Lone Jack volumes, the latter of which has never before enjoyed book length treatment. Also, author and translator Joe Reinhart notified me that his book A German Hurrah! : Civil War Letters of Friedrich Bertsch and Wilhelm Stangel, 9th Ohio Infantry will indeed be released by The Kent State Univ. Press at the end of the month. I am especially looking forward to the material pertaining to the 1861 campaign in western Virginia. According to his facebook page, Eric Lindblade's Fight As Long As Possible: The Battle of Newport Barracks, North Carolina, February 2, 1864 will be available from his publisher, Ten Roads, on June 21. 1. Haunted by Atrocity: Civil War Prisons in American Memory by Benjamin G. Cloyd (LSU Press, 2010). Cloyd seems to want to argue that, although competing accusations of willful mistreatment inhibited reconciliation through the early 20th Century, the passing away of the Civil War generation and the scale of unspeakable crimes against prisoners in the two world wars tended to result in a shared understanding that masked the true horrors of Civil War prisons. 2. Mississippi in the Civil War: The Home Front by Timothy B. Smith (U. of Mississippi Press, 2010). Smith has been busy these past few years, with seemingly every season having at least one book released with his name attached. This one takes an in depth look at all segments of Mississippi society during the war years. Hewitt & Bergeron (eds. 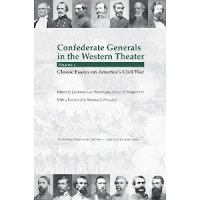 ): "CONFEDERATE GENERALS IN THE WESTERN THEATER, VOL. 1: Classic Essays on America’s Civil War"
This essay collection is the first volume in University of Tennessee Press's new Western Theater in the Civil War series. Dedicating its fifteen chapters to noted historian Thomas L. Connelly, general editors Larry Hewitt and the late Art Bergeron assembled for Confederate Generals in the Western Theater, Vol. 1 a who's who of scholars. Five additional series volumes are already in the works, three more for the West and a pair covering Trans-Mississippi generals. But why begin with a compilation of previously published essays? Most of the articles originally appeared in obscure publications, read by few, and the editors felt they were deserving of renewed attention for a wider audience. Because the demands of scholarship have become more exacting over time and interpretations necessarily change with the introduction of new source material and specialist studies, it is no surprise that the strength of the essays (one is almost 50 years old) varies, although the editors did go back and standardize the notations and some of the authors revised and updated their work for the new volume. Additionally, there are some editorial comments inserted within the notes. The first essay, a brief and uncompromising composition by Grady McWhiney, takes note of Leonidas Polk's unbroken stream of military blunders and insubordinate behavior. Although it appears impossible for any future scholar to discover the means to elevate the bishop's martial reputation, McWhiney does mention Polk's only discernible positive leadership trait, that of great popularity with his men. The baffling source of this would perhaps be a subject worthy of further review. Most Civil War readers are familiar with Charles Roland's sympathetic assessment of Albert Sidney Johnston, first outlined in his 1964 biography. With only a limited early war command record (albeit disastrous in ultimate result), and denied the opportunity his peers enjoyed of growing into the position of army command, the quality of Johnston's leadership remains open to a wide variety of interpretations. Roland elected to take an optimistic tack, but others will undoubtedly disagree. Originally published in Civil War History in 1955, T. Harry Williams's look at P.G.T. Beauregard at Shiloh appears in places a bit dated [e.g. "If any one man saved the Union army at Shiloh, (Benjamin) Prentiss was the man"(pg. 35), a view largely on the wane today], but remains a useful summary for the uninitiated. Like Roland on Johnston, Williams maintained the equally debatable position that Beauregard's conduct at Shiloh showed ability and bright promise. One of the best and freshest essays is Art Bergeron's mini-biography of unfairly maligned (the author would argue) General Mansfield Lovell. Students are familiar with President Davis's scapegoating of Lovell for the fall of New Orleans in 1862, but less well known are the multitude of attempts by superior officers to obtain Lovell's services as a division and corps-level commander, all of which were bluntly rebuffed by Davis. Another factor that did not endear the officer to Davis was Lovell's very close connection with Davis's Mississippi political rival John Quitman. Bergeron makes a very persuasive case that it was the mentor-protege relationship (more like father and son) with ardent secessionist Quitman that most directly influenced the northern-born Lovell's decision to 'go South', even two of his brothers married Quitman daughters. Allowed no combat role after the October 1862 Corinth Campaign, the general's limited command history makes his military prowess more difficult to assess, although Bergeron credits him with doing all he could reasonably do for New Orleans. Three other essays review in a similar manner the Civil War careers as a whole of John C. Pemberton, Patton Anderson, and Daniel C. Govan. Pemberton biographer Michael Ballard reinforces the now conventional view of the general as a highly skilled administrator but poor battlefield commander. While many West Point-trained officers like Pemberton were promoted to line positions beyond their capacity and without having to truly prove themselves, several non-professionals rose to general officer rank in the western armies on the strength of their combat performances. Two of these are Patton Anderson and the lesser well known Daniel C. Govan, their Civil War services ably chronicled and analyzed in largely positive pieces by Richard McMurry and Daniel Sutherland. The other series co-editor, Larry Hewitt, also contributed an article, a defense of Braxton Bragg's strategic sensibility as exhibited during the 1862 Kentucky Campaign. The author's argument that Bragg's "campaigning by maneuver should have become the primary Confederate strategy in the western theater"(pg. 82) is an intriguing one, and sure to engender debate over its viability given the limited logistical and transportation resources of the South. Hewitt's essay also serves as a reminder that the general is badly in need of a balanced modern biographer. Bragg is also the subject of Steven Woodworth's chapter, an account of the general's maddening inability (with blame surely cutting both ways) to get his major subordinates to respect his authority and judgment, and follow his orders, during the 1863 Chickamauga Campaign. Archer Jones adds a fine analysis of the early period of Joe Johnston's stint as western department commander, overseeing the coordination of armies in Middle and East Tennessee, Mississippi, and Alabama, while extending the hand of cooperation to Samuel Jones's command in SW Virginia. The author demonstrates that Johnston actual devised and managed a creditable strategic plan, involving the rail network and a large interdepartmental cavalry force, that performed well on two test runs. Unfortunately, Johnston characteristically did not share his plans with the Davis administration and, worse, complained outwardly that the situation was impossible, leading this reviewer to speculate that he was positioning himself to reap the benefits of success while at the same time cultivating an excuse for defeat. Tactical direction in specific battles are the subject of articles by Craig Symonds, Edwin C. Bearss, and Nathaniel Cheairs Hughes. Patrick Cleburne biographer Symonds uses the events of the 1863 Tunnel Hill battle as a window through which the Irish-American's extraordinary quality of coolness in demeanor and clearheaded decision making under fire can be scrutinized. Not surprisingly, Bearss takes on Forrest at Brice's Crossroads, and Hughes gives William J. Hardee high marks for his defense and smooth evacuation of Savannah in 1864. Hood's campaigns in Georgia and Tennessee are the subject of a pair of chapters. In the first, William Cooper posits that President Davis's support for the strike into Tennessee was the correct, albeit most risky, decision both militarily and politically. A persuasive argument can be made that a high risk-high reward operation was required at this desperate point in the war. Less positive is Frank Vandiver's article outlining John Bell Hood's failures in overseeing his army's logistics post-Atlanta. This assemblage of "classic" writings by multiple generations of esteemed western theater historians is well worth reading by Civil War military history students, new and old. While some of the material and opinions presented will be quite familiar to the latter, enough unusual and thought provoking ideas and analysis are exhibited in the book's pages to satisfy both groups. The quality of this first volume bodes well for the future of the series. In the Civil War naval literature, the amount of attention paid to the ships and men of the Pacific Squadron is dwarfed by the scholarship devoted to the Gulf and especially the Atlantic blockading squadrons. The disparity is far greater than that found in the land war writings, where the Trans-Mississippi nevertheless takes a definite backseat to its western and eastern theater cousins. Typical is the recent and otherwise fine study by Stephen Taaffe Commanding Lincoln's Navy: Union Naval Leadership During the Civil War, which barely mentions the Pacific. In November, the University Press of Florida will publish as part of their excellent New Perspectives on Maritime History and Nautical Archaeology series A Civil War Gunboat in Pacific Waters: Life on Board the USS Saginaw by NOAA archaeologist Hans Konrad Van Tilburg. A new ship, commissioned in 1859, the sidewheel steamer USS Saginaw cruised the Far East before being refitted for Civil War duties that included patrolling the west coast of North America from the Canadian border to Central America. In 1870, the ship was wrecked near Kure Atoll, an isolated reef located approximately 50 miles from Midway Atoll. 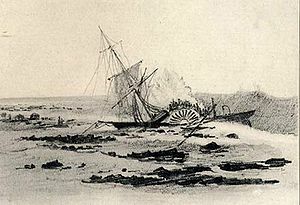 Tilburg led the team that discovered the wreck, and his book's narrative promises a look at the ship, its crew, and its mission from both historical and archaeological perspectives. 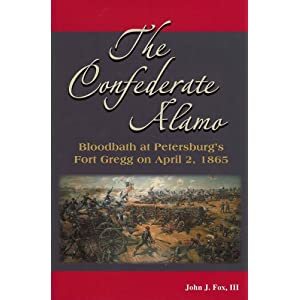 Fox: "THE CONFEDERATE ALAMO: Bloodbath at Petersburg's Fort Gregg on April 2, 1865"
In his own critically acclaimed book, historian and Petersburg specialist A. Wilson Greene expertly chronicled the final week of the Petersburg Campaign, and meticulously reconstructed the April 2, 1865 day of decision, but John Fox's The Confederate Alamo is the first full length study of the vicious fighting at took place inside and around Forts Gregg and Whitworth, a pair of detached earthworks located just outside of the west-facing stretch of Petersburg's inner line of defenses (the "Dimmock Line"). His book makes a strong argument for the importance of these events, a stand by a small group of Confederates that made it possible for the rest of the Petersburg defenders to escape the rapidly closing federal ring around the city. The Confederate Alamo begins with the Union 6th Corps's crushing dawn assault on the Outer Line west of the Church Road. The 6th's attack pierced the Confederate trenches occupied by the brigade of James H. Lane, and, in conjunction with the 24th Corps on its left, wheeled to the right and headed toward Petersburg. By midday, only a scratch force of just over 500 Confederates, mostly Mississippians, North Carolinians, and Georgians, stood between the advancing Federals and Petersburg itself. At that time, the western section of the Dimmock Line was essentially undefended, as Charles Field's division would not complete its arrival at the Inner Line until nightfall. By Fox's best guess, 334 men were available to defend Fort Gregg (with an additional 200 at Fort Whitworth, 700 yards to the north). These men were overwhelmed by three waves of attacks by the Union divisions of Robert S. Foster and John W. Turner. A substantial number of Whitworth defenders were able to escape but Fort Gregg's garrison was surrounded and annihilated, with only 33 unwounded men captured. Near suicidal bravery abounded, with the attackers suffering heavy casualties as well, over 800 killed and wounded. The author reconstructs each of these attacks in detail, supported by regimental scale maps drawn by noted cartographer George Skoch. Utilizing an impressive mass of manuscripts and other primary source material, the author ably incorporated into his narrative the personal experiences of a large number of participants from both sides. As well as later observers, the men at the time realized Gregg's fatal flaw, a north running section of unfinished earthworks beginning at the northwest corner of the fort that created dead space that attackers could (and did) exploit. In the final estimation, what was the significance of the brave stand at the forts? Fox makes a convincing case the sacrifice was not an empty one, as there is good evidence that a Union attack on the Inner Line at midday could have been disastrous for the Confederates attempting to evacuate Petersburg. As it was, the forts were not secured until 3 p.m., with Generals Grant and Gibbon calling off further attacks until the next morning. In hindsight, the Union leaders made a mistake in halting the attack with three hours of daylight remaining, but they could not have known how lightly defended the Dimmock Line was at the time. In addition to the maps and photographs, a large amount of supplementary material is located in the appendices. A local driving map and directions are available, as well as detailed orders of battle and casualty counts. The author also attempted to construct an accurate roster of Fort Gregg defenders (labeled k/w/c), taking the step of categorizing the presence of each individual as 'definite', 'probable', and 'possible', with the obvious result that there are more than 334 names included. Some of the controversies surrounding the battle are also discussed, such as the issue of the artillery withdrawn from Fort Whitworth, which unit planted the first flag atop Fort Gregg, and which artillery units helped defend the forts. A list of Fort Gregg Medal of Honor recipients is also provided. The Confederate Alamo is an impressive demonstration of author John Fox's skill as a researcher and writer of Civil War tactical battle history. Every student captivated by the military historical aspects of the Petersburg Campaign will want a copy of this fine book. It is highly recommended. 1. The Tennessee Brigade by Randy Bishop (Pelican Publishing, 2010). This is a substantial unit history of the Anderson/Hatton/Archer/McComb brigade that fought with the Army of Northern Virginia. 2. Gettysburg as the Generals Remembered It: Postwar Perspectives of Ten Commanders by Robert P. Broadwater (McFarland, 2010). 3. Abner Doubleday: A Civil War Biography by Thomas Barthel (McFarland, 2010). The focus is on the military career -- Seminole, Mexican, and Civil Wars -- of Doubleday, with a lengthy chapter at the end dealing with the mythology surrounding the general and baseball.